A unique blend of Joshi wrestlers, male wrestlers, and American women wrestlers. Let’s get to the fun. We start off with an early card match containing four wrestlers that most people won’t be too familar with. I have seen Sonya and Nyla on a few occasions, but Ashley and Jessika are new to me. Nyla Rose has actually been a regular in Marvelous since this event, she impressed enough in tryouts that she has become a regular fixture in the promotion. Sonya is a young wrestler that also wrestles in AIW and Beyond, which is where I have seen her before, while her partner Ashley wrestles in various small promotions around the Northeast. Jessika Black is a Canadian wrestler that mostly wrestles in Northern Championship Wrestling. I am not expecting much since they are all pretty inexperienced, but I try to go into matches with an open mind. Jessika and Sonya start the match for their teams and trade wristlocks, they then trade schoolboys but neither can get the quick win. Jessika tags in Nyla while Ashley is also tagged in, Lou Thesz Press by Ashley but Nyla pushes her off and hits a big boot. Nyla picks up Ashley and drives her into the corner before tagging in Jessika, shoulder tackles by Jessika and she tags Nyla back in. The beatdown of the smaller Ashley continues for a few minutes, Ashley fires off a few dropkicks to Nyla and finally knocks her off her feet. Ashley tags in Sonya while Jessika tagged in as well, Sonya kicks around both of them before covering Jessika for two. Ashley returns and they both hit crossbodies on Jessika and Nyla, sending them out of the ring. Nyla returns to face off with Sonya, but Jessika attacks Sonya from behind and hits a shoulderblock. Jessika elbows Sonya in the head and applies a headscissors, she releases it after a moment and Sonya kicks Jessika into the corner. Body Avalanche by Jessika in the other corner, she picks up Sonya and hits a DDT for a two count. Jessika tags Nyla, Nyla twists at Sonya’s knee but Sonya gets away and tags in Ashley. DDT by Ashley to Nyla, she tags Sonya back in and Sonya gets Nyla’s back. Sonya goes for a sunset flip but Nyla blocks it and sits on her, Nyla grabs the ropes for leverage and she gets the three count! Ashley and Sonya are the winners. This match was somewhat decent until the ending, I have absolutely no idea what happened but the last 45 seconds was one of the most awkward and unusual endings I’ve seen in my life. Up to that point it wasn’t anything special, mostly basic offense and lots of tagging in and out with little story. None of them came out of the match looking particularly good, this is an example of why matches should have at least one veteran to lead things along if possible. They may turn out to the great down the road, but nothing worth watching here. 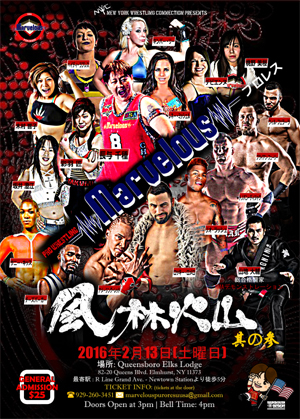 One of the more interesting things that Marvelous has done in recent memory is have one of their new wrestlers, Mio Momono, debut on this event instead of in Japan. Mio is only 18 years old and is the first Marvelous trainee since the promotion became a more full-time establishment. Renee debuted in 2013 and like Nyla she impressed Marvelous enough that she has been wrestling in the promotion ever since this event. Kyoko needs no introduction, she is one of the most popular veteran Freelancers in Japan, while Davienne is a 22 year old wrestler that mostly wrestles in smaller promotions in the Northeast. Young Mio and Kyoko kick things off for their teams, Kyoko gets Mio to the mat and gets her in a headlock, wristlock by Kyoko but Mio armdrags out of it and the pair trade quick trips. Renee and Davienne tag in, Renee kicks Davienne in the face and armdrags her to the mat. Dropkick by Renee, and she covers Davienne for two. Davienne wants to tag out and Kyoko eventually agrees while Mio also tags back in, Kyoko twists Mio’s hair and tosses her down by it a few times. Kyoko and Davienne take turns attacking the rookie in her debut, after several minutes Mio gets away and finally makes the hot tag to Renee. Kyoko spits at Renee but Renee hits a headscissors and kicks Kyoko in the ropes. Renee hits a second turnbuckle moonsault, but it only gets a two count. Renee picks up Kyoko but Kyoko swings her down and applies a Fujiwara Armbar. Kyoko tags in Davienne, Samoan Drop by Davienne and she covers Renee, but Renee bridges out of it. Renee dropkicks Davienne and tags in Mio, dropkick by Mio to Davienne and she hits another one, but Davienne knocks her to the mat with a bodyblock. Sidewalk Slam by Davienne, and she covers Mio for two. Davienne tags in Kyoko and Kyoko kicks at Mio, but Mio ducks the boot and hits a headscissors. Dropkicks by Mio, she finally knocks Kyoko to the mat and covers her for a two count. Mio picks up Kyoko and hits a series of elbows, but Kyoko slams her to the mat. Kyoko puts Mio in a stretch hold while taunting Iroha at ringside, she lets go of her but Mio sneaks in an inside cradle for two. Mio goes for a crossbody on Kyoko and Davienne but gets caught, Renee goes up top and hits a missile dropkick to knock over all three of them. Mio and Renee take turns on Kyoko, Mio goes up top and hits a diving crossbody for a two. Mio picks up Kyoko but Kyoko puts Mio in a STF, which is quickly broken up by Renee. Kyoko puts Mio in a choke but Mio gets a foot in the ropes, cover by Kyoko but it gets a two count. Davienne comes in and destroys little Mio with a lariat, vertical suplex by Kyoko but Mio barely kicks out of the pin. Kyoko picks up Mio but Mio avoids the sleeper and applies a backslide for two. Mio goes off the ropes but Kyoko takes off her head with a big boot, and she picks up the three count! Davienne and Kyoko win the match. For a match as long as this one, it had very few memorable moments. Davienne’s lariat on Mio was really the only move that left an impression, as most of the rest of the match was pretty basic. Which was likely necessary, between having a debuting wrestler and any possible language barriers, but normally you wouldn’t expect a match with those obstacles to be so long either. There weren’t any signs of miscommunication or awkwardness, which is a big plus, but it lacked that something special that would make me recommend anyone watch the match. Not bad, just thoroughly average. We are starting to get to what I would consider “the good stuff.” Kyoko we already know from the last match (on the live show there was a match between so she got a bit of a breather), her partner Fury is a veteran in the Northeast wrestling scene. Cheeseburger also wrestles in Ring of Honor, he is part comedy and part relatable underdog. Takumi Iroha started in Stardom but left the promotion in January of 2015, she has been wrestling in Marvelous since then. An interesting mixture of wrestlers, hopefully everyone gels well since they don’t have a lot of experience against each other. Kyoko and Cheeseburger are the first two in, Cheeseburger rolls around the ring while Kyoko mostly just looks confused about what is going on. Cheeseburger goes for shoulderblocks but Kyoko doesn’t budge, they both go for hiptosses but Cheeseburger distracts Kyoko with a dance before rolling her up for two. Hard shoulderblock by Kyoko, they trade quick pins and both wrestlers return to their feet. Takumi and Fury tag in, Fury pushes Takumi against the ropes but he gives a clean break. Side headlock by Fury and he hits a shoulderblock, armdrag by Takumi and she dropkicks Fury to the mat. She tags in Cheeseburger and they both elbow Fury, cover by Cheeseburger but it gets two. Jawbreaker by Fury but he accidentally knocks Kyoko off the apron, Cheeseburger goes off the ropes but Kyoko pulls him out of the ring with her and she beats him around the floor. She rolls Cheeseburger back in, scoop slam by Fury and he tags in Kyoko. Kyoko pulls at Cheeseburger’s hair and stomps him down in the corner, Fury returns and drops Cheeseburger with a backdrop suplex. Kyoko is tagged back in and she literally spanks Cheeseburger repeatedly, she grabs Cheeseburgers arm and starts biting his fingers. She hides it from the referee for a bit as she keeps biting him until he finally catches on, Fury comes in but Cheeseburger fights them both off and tags in Takumi. Superkick by Takumi to Kyoko, she drives her into the corner but Kyoko kicks her when she charges in. Powerslam by Takumi, and she covers Kyoko for two. Takumi picks up Cheeseburger and drops him onto Kyoko, she then picks Kyoko up but Kyoko blocks the suplex. Guillotine Choke by Takumi but Kyoko muscles out of it and hits a vertical suplex. Kyoko and Takumi both slowly get up and trade elbows, spinning heel kick by Takumi but Fury runs in to knock Cheeseburger off the apron so that Takumi can’t tag in. Kyoko does tag in Fury however, Michinoku Driver by Fury but Takumi kicks out of the pin. He goes for a backdrop suplex but Takumi lands on her feet, Cheeseburger comes in and helps Takumi get Fury over for a German suplex. This gives her time to tag in Cheeseburger, they both pick up Fury but Kyoko comes in and kicks Takumi and Cheeseburger from behind. Kyoko and Takumi leave the ring while Fury kicks Cheeseburger in the ring, tornado DDT by Cheeseburger but Fury blocks the palm strike. Pop-up sit-down powerbomb by Fury, and he picks up the three count! Kyoko Kimura and Brian Fury are your winners. Main Event time, this was not only the final women’s match on the show but was the last match of the event as well. Lovelace and Kimber Lee are both well known wrestlers in the Independent scene in the United States, wrestling in promotions such as SHIMMER, SHINE, AAW, Beyond, CHIKARA, and more. Neither have been signed to WWE/NXT but I wouldn’t be surprised if they get there sooner than later if that is their goal. Takumi Iroha we just saw, she is the young Marvelous future Ace, while Sumie Sakai is a 20 year veteran who started her career in Japan but has been wrestling in the United States for over 15 years. Heidi and Sumie attack before the match starts but Kimber and Takumi quickly take over and isolate Sumie. Kimber stays in with Sumie and hits a tilt-a-whirl backbreaker, she tags in Takumi but Sumie avoids Takumi’s charge in the corner. Sumie slides to the apron but Takumi suplexes her back in, she goes off the ropes but Heidi knees her from the apron, allowing Sumie to hit a Northern Lights Suplex for two. Sumie tags in Heidi, Heidi grabs Takumi with her legs and delivers the Deadly Night Shade. Heidi and Sumie take turns attacking Takumi, Sumie puts Takumi in a the Figure Four Leglock, Heidi goes up top and hits a diving body press while Takumi is still in the hold. The referee stops her when she goes to do it again, Takumi manages to reverse the move but Kyoko comes in and rolls them back over. Kimber then goes up top and hits a diving body press on Sumie which breaks up the hold, but Takumi can’t make the tag. Takumi is triple teamed in the ropes with the assistance of Kyoko before Sumie tags in Heidi, kicks by Heidi but Takumi fights back with elbows. Sumie is tagged back in and she applies a rolling grounded necklock, Cobra Clutch by Sumie and Heidi comes in to kick Takumi in the chest. Sumie tags Heidi but Takumi catches Heidi with a German Suplex which gives her time to tag in Kimber. Lariats by Kimber and she boots Sumie in the chest, she picks up Sumie in a vertical suplex but transfers her to Takumi so that Takumi can finish the move. Swanton Bomb by Kimber, Takumi follows with a diving body press but the cover is broken up. Takumi picks up Sumie and goes for a powerbomb, but Sumie reverses it with a hurricanrana. Takumi suplexes Sumie while Kimber also suplexes Heidi, Takumi goes up top but Heidi grabs her from the floor. Sumie joins Takumi and hits a Frankensteiner, but Takumi kicks out of the pin attempt. Sumie tags in Heidi, missile dropkick by Sumie but Kimber runs in and kicks Sumie. Backdrop suplex by Heidi to Kimber and all four wrestlers are down on the mat, Heidi and Takumi are up first and they trade elbows. Heidi goes off the ropes but Takumi blocks the Heidi-Can-Rana and nails a sit-down powerbomb, picking up the three count! Kimber Lee and Takumi Iroha win the match! I can’t give the show a rating like I usually do since I only talked about four of the ten matches, but the entire event was fun. As of this moment no other Marvelous Puroresu USA events are scheduled and it looks like the experiment is over, which is a shame as it did give fans in the United States something new and different to watch. If you can track down the DVD it is a solid event, the matches in general were too short since ten matches were crammed into a little over two hours, but most of the matches were good and its always a pleasure to get to see Kyoko and Takumi.